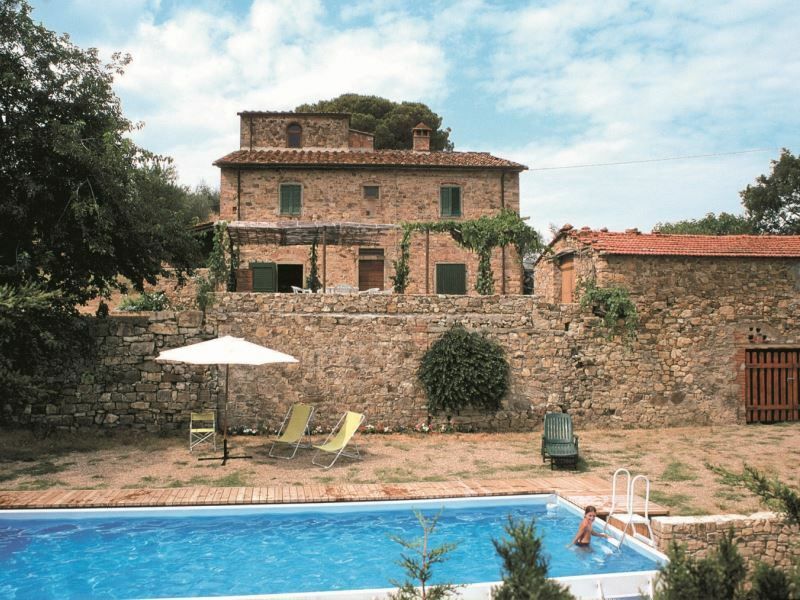 Old panoramic country house with pool, sleeps 7. Pets are welcome. A farmhouse with really ancient origins. Picturesque old country house placed in a peaceful position with stunning view over the below valley. The property is reachable by an unmade road 1,5 km long. Its origins are really back in the past as some 1500 clerical registers and documents certify. The city of Arezzo, events and services. Arezzo is 10 km far and with its folkloristic and cultural events (such as Giostra del Saracino and Fiera Antiquaria) is worth visiting. The redbrick ceilings with beams, the floors made of original terracotta and the simple furniture offer a rare example of Tuscan rural style and traditions. Outdoor areas, pergola and swimming pool. In the garden there are a 5x9 m swimming pool (depth 1,20 m) and an attractive pergola equipped to have meals. Those who loves horses will find riding stables about 500 metres far from the property. GROUND FLOOR: laundry room, bathroom with shower. FIRST FLOOR: Spacious dining room with kitchen facilities and a truly beautiful stone fireplace, double bedroom, two bedrooms with two single beds, bathroom with bath and shower. An attractive wooden staircase takes you up to a living room, which has been created under the roof, with a single sofa bed. EQUIPMENT: oven, washingmashine, fridge, microwave, Wi-Fi Internet access. Arezzo it is one of the oldest cities in Tuscany and stands where the four valleys of the province meet: the ValdiChiana, Valdarno, Valtiberina and Casentino. Thanks to its geographical position it has been a point of encounter for different civilizations and cultures. The city of Arezzo is of Etruscan origin and was then a small Roman fortress, commerce flourished here in Medieval times and artistic production in the Renaissance period. The town conserves important examples from all these periods in its churches and monuments and in the objects housed in its museums. Amongst the most important works are the Romanesque "Pieve" with its tower with a hundred holes, the cathedral with its stained glass windows by Guglielmo di Marcillat, the basilica of San Francesco with its precious works by Piero della Francesca, the Gothic church of San Domenico with its crucifix by Cimabue. The splendid setting of Piazza Grande in Arezzo, dominated by Vasari’s loggia hosts the “Saracen Joust” (Giostra del Saracino) twice a year (in June and September) and the Antique Fair on the first weekend of every month which spreads through the nearby streets and where one can buy antique furniture and accessories. INCLUDED IN THE PRICE:Private pool open from 12/05 to 22/09. Wi-Fi Internet access (1 GB per day).Property cleaned and supplied with bed linen and bathroom towels with weekly change. One baby bed (for children up to 3 years) on request at time of booking. Electricity, hot and cold water.NOT INCLUDED IN THE PRICE:Breakage deposit Euro 200 (payable in cash on your arrival and held by the owner for the duration of your stay). Obligatory final cleaning Euro 70. Pets are welcome on payment of Euro 5 each per day. Wood Euro 15 each 100 kg (if used).